Hey Sugar Fix readers! Our end-of-the-week blog this week is a bit different; this week we’re showcasing some of our great patient smiles and restorative work, all done by Dr. Emery by using Invisalign, whitening, and veneers. She has been out of the office this week soaking up the sun in Cali! She and Andrew celebrated their 10 year anniversary and visited old friends (including former patients of Dr. Emery’s)! 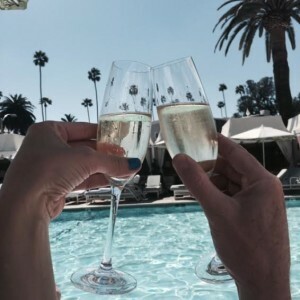 Dr. Emery & Andrew toast their 10-year wedding anniversary! Here at The Loft we were catching up on patient cases to share with you! Before and after of a Sugar Fix patient- the lower picture shows the same patient after Invisalign, whitening, and a veneer! This is an amazing example of a patient of ours. She went through the Invisalign treatment, completed the Zoom in-office whitening procedure, and also had a veneer placed on her lateral tooth (next to the front tooth). Once her tooth rotated into proper position, it appeared smaller than the tooth on the opposite side and she wanted a picture-perfect smile. Dr. Emery definitely delivered! 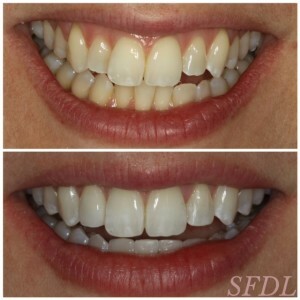 The results are awesome, and the patient is very happy with her gorgeous smile. Thursday we saw an array of shades of green on the folks walking past The Loft windows! As a team, we celebrated St. Paddy’s Day the week before since we knew Dr. Emery wasn’t going to be with us this week! 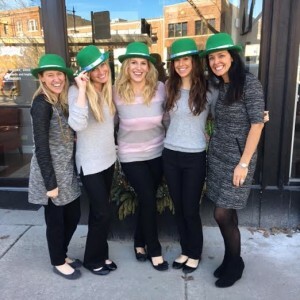 Tricia, Nicole, Ashley, Hannah, & Dr. Emery all sporting lucky green hats in celebration of St. Paddy’s Day. 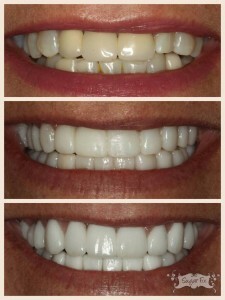 The smile transformation below required new crowns on each of the patient’s teeth. She came in with old crowns that were breaking down at the margins (where the tooth meets the crown) and there was metal exposed, which never looks pretty on a smile! Since we were building her teeth up from the wear and damage to her old crowns, she was in her trial smile, or temporaries, for about three weeks to make sure she acclimated to her newly designed smile. The end result looks amazing! The patient and her husband are now regulars at The Loft! We LOVE our patients! If you would like to see more of our smile makeovers, please visit our Smile Makeover page. You may also check them out on Instagram by following us @sfdlsmilegallery or check out our trial smiles @sfdltrialsmiles. We hope you have a WONDERFUL weekend. Spring really is right around the corner! Happy Anniversary Dr. Emery & Andrew!! ???? I’m the lucky one who gets to wear this incredible smile! Dr Emery and her team are an amazing group of gals! It’s crazy when you look forward to going to the dentist.Thanks for all you do! I’m the lucky one who gets to wear this incredible smile! Dr Emery and her team are an amazing group of gals. It’s crazy when you look forward to going to the dentist. Thanks for all you do!